"address": "57 luscombe st, brunswick, melbourne"
"address": "105 collins st, 3000"
You can integrate popular cloud-based platforms with GetSwift. These include e-commerce platforms, ordering portals, form builders, spreadsheets, scheduling applications, payment gateways, etc. Can't find your platform? 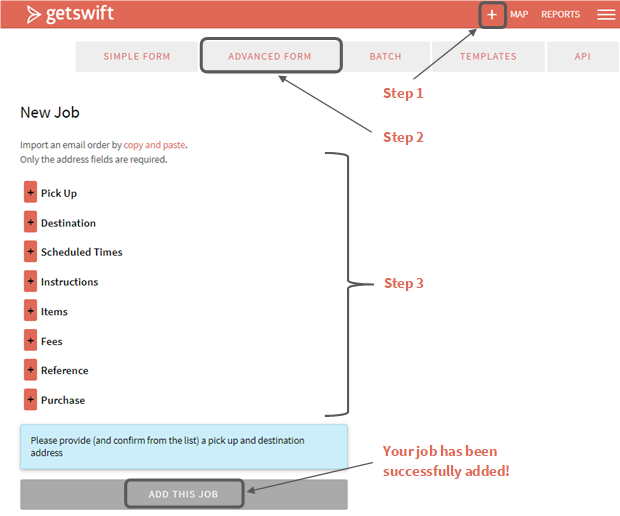 We'll find a way to automate getting your jobs into GetSwift so contact us today! Click "Add this job" at the bottom of the page to create your task! Click "Add this job" at the bottom of the page to create your job! Allows you to upload multiple jobs, all originating from the same pickup point, at one time into GetSwift. Click “download this example” and open the downloaded CSV file in Microsoft Excel or another spreadsheet editor. You will use this file to enter your job details in preparation for upload. Click “Show our accepted column headers” to see the list of acceptable data fields. Add any additional columns needed to your CSV file. 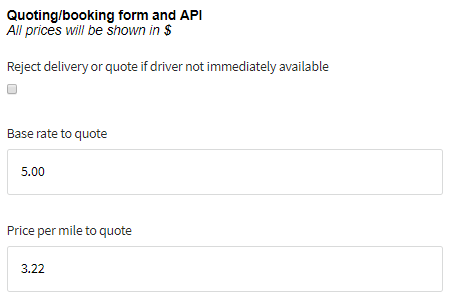 Note: All jobs in each CSV file must have the same pickup address. If you have multiple pickup addresses, you will need to create a separate template and CSV for each. Part 3: Upload To GetSwift! The upload will automatically start and the progress status will be shown on the screen! 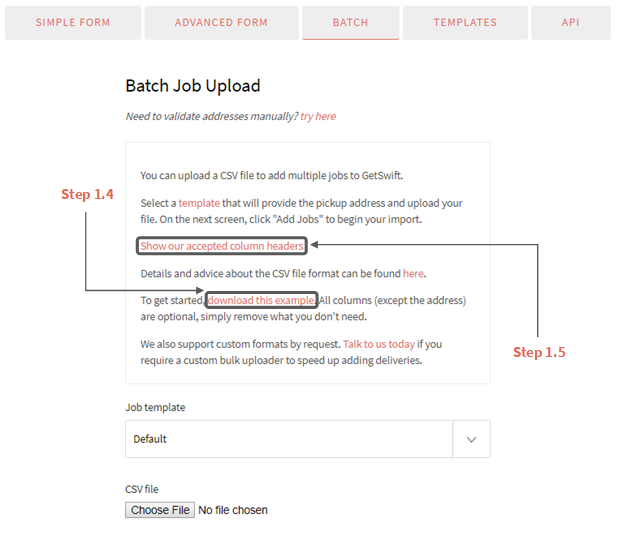 Part 4: Go to the Map or Live Jobs to see the Batch Load into GetSwift! Dates and times should be in the format: "2018-06-22 14:10" or "6/22/2018 14:10"
All jobs in each CSV file must have the same pickup address. If you have multiple pickup addresses, you will need to create a separate template and CSV for each.